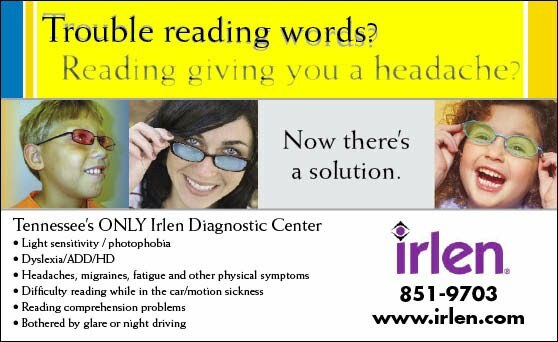 The Irlen Treatment Method provides an effective means to screen, diagnose, and treat Scotopic Sensitivity Syndrome (also called Irlen syndrome). Individuals with Irlen syndrome may be viewed as underachievers or as having behavior, attitude, or motivational problems. At Expressways To Learning® - TN, screening assessments are provided for this syndrome. For people with Irlen Syndrome, some assistance may be obtained by the use of low-cost colored filters, which we have available. Many students who participate in the Expressways To Learning® programs experience improvement or resolution of symptoms. For some people, best results will be obtained by referral to an Irlen Diagnostician for a more intensive diagnostic procedure and for fitting with colored lenses. Benefits from treatment may include elimination of headaches and fatigue from reading, and improvement in academics, coordination, and self-confidence. To see if you or someone you know has Irlen Scotopic Sensitivity Syndrome, take the Short Self-Test.